This is a work of fiction. Any resemblance of characters to actual persons, living or dead, is purely coincidental. The Author holds exclusive rights to this work. Unauthorized duplication is prohibited. “Ah ha ha ha! Look at that demon fucker!” A young male voice in Angraboda's head mocked her. “AH HA HA HA HA!” The laughter in Angraboda's voice rang out, mocking her and belittling her. Years have passed since Loki's pure blooded demon spawn were born and banished from the light world of Godheim. Years have passed since Angraboda divorced Loki in a fit of rage. But even when those years have come and gone, the reputations of both Loki and Angraboda were still tarnished. People are still not letting this divine scandal die down. Now, no one wanted to take Angraboda's hand in marriage even again, let alone, just casually date her. Even her own family has cut dies with her, and banished her from their household. Now, Angraboda was living alone, in another far away frost Jotunn settlement in Godheim. She lived alone and was quite a bitter Jotunn woman. However, years since the demon triplets were separated at birth, and banished to various locations far from where she lived, Angraboda believed that those demon children died from exposure. She believed that they were dead, and she felt relieved at that thought, for that thought was one of the few things that brought her happiness. Another things that brought Angraboda happiness, was thinking of ways to get revenge on Loki for lying to her about his heritage. Oh yes, this thought of revenge brought her great joy, as she prepared to settle down for the night, dreaming wicked little dreams of revenge and torment to those who brought her such great bitterness in her life. Meanwhile, back at the Aesir kingdom of Walhalla, deep within the men's living quarters, Loki was deep in thought. Deep in thought with what his life has become after the first Twilight of the Gods. He was rather disgusted with himself, with his demon heritage, of all things. He thought he found true love forever with Lady Angraboda. She claimed to unconditionally love him back in return. She even accepted him for being an intersexual deity. But once the full blooded demon children were born, it all came to an end. Loki's demon heritage has been revealed, and Angraboda divorced him out of spite and hatred of demons. Now, Loki felt alone. He felt like almost everyone who has grown fond of him, have abandoned him after the divine scandal took place years back. “It is I Loki.” A male voice said back. The voice belonged to no one other than King Odinn, Loki's sworn brother. “Oh, it's nothing important, really....” Loki said, as he now started to blush. “Are you still having those nightmares sbout those demon spawns you and Angraboda disposed of years ago.” Odinn asks Loki in a concerned tone of voice. “Okay, I will. Thank you.” Loki replied as Odinn left Loki's room in the male quarters of Walhalla castle. Loki felt a little more at ease now. He felt reassured by Odinn's words, and will try what he can to put the past behind him. He believed that his demon spawns were dead and gone, no longer there to torment him. He felt more comfortable and at ease now. However, Loki was purely living in blissful ignorance, for there will be more futures struggles for him to deal with. In thre region of Jotunheim, on the way from picking up groceries from the bazaar market, Angraboda was greeted by an elderly Jotunn woman, clad in a tattered cloak, dress and apron. Angraboda felt rather uneasy around this poor old woman, thinking she was a wicked witch out to deceive her. “Please, please, give me some potatoes!” The old woman begged as Angraboda was guarding her groceries. “Please....please my good lady! Just give me those potatoes!” The old woman begged in sadness. “Please! Please!” The old woman begged. “Humph! You shouldn't have done that!” The old woman spat in anger. “It's simple really...” The old woman chided as she started to transform before Angraboda's eyes. The old woman now, transformed into her true self, which was that of a Chalkydri angel. 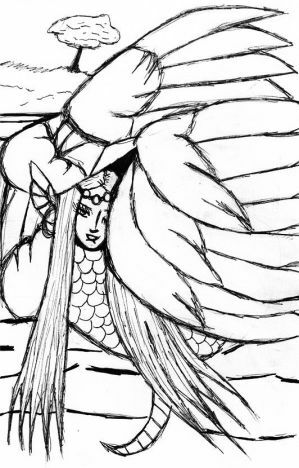 Her default form resembled an attractive young woman's head, complete with long silvery blue hair that flowed like liquid platinum, with her lower body, resembling a serpent with silver and blue scales, and has six, bluish white wings on her back. On her head, she wore a golden bejeweled circlet, and wore gold hoop earrings on her wing ears. She also had golden makeup decorated on her youthful face. “No....No! I refuse to know about it!” Angraboda cried out as tried to run away from Muse. But Muse was far more clever than to let her escape. So with her snake tail, Muse grabs onto Angraboda's right ankle, and makes the Jotunn woman trip and fall down flat on her face. Angraboda then felt herself begin dragged closer to the Chalkydri Oracle, as they meet eye to eye with each other. “Oh yesss my darling Angraboda, I shall tell you all about your future....Kya ha ha ha ha!” Muse laughed in an ominous tone of voice. A huge grin formed on Muses face, as she started to explain everything to Angraboda. “My dear Angraboda.....I know of those pure blooded demon triplets that you and Loki abandoned at birth, as well as separating them from one another. I know all about them.” Muse said to Angraboda in a chiding tone of voice. “Why you....you.....!” Angraboda stuttered in rage. Now, Muse transformed into a beam of light, and vanished from where Angraboda was standing. This time, I'm trying something completely different with the second within the RoA: In the Beginning story arc. Instead of just focusing on Princess Halja and Prince Bullar, I decided to give Halja's long lost brothers, Fenris and Jormungand, a time to shine in the spotlight along side their estranged sister. It's about time I developed the characters of Fenris and Jormungand as well. I'm also writing a plot outline to help me out with writing my stories now. I hope this comes in handy, when writing stories that focus on multiple lead characters, and each of his/her POVs. Wish me luck everyone! Ta Ta for now! This is a work fiction, inspired by a Russian folk tale, originally written by Alexander Nikolaevich Afanasyev, and later translated into English by both Leonard A. Magnus, and Arthur Ransome. Any resemblance to actual persons, dead or alive, or real life events, is strictly coincidental. Many ages ago, there was a soldier who was very devoted to God, and The Great Sovereign, for two decades, and five years. Today, the soldier was coming home from a great war, which The Great Sovereign won. However, the soldier was worn out from battle, and all he had left over, was three separate food rations he saved for days. “Mmmgh! I am so famished...So tired....” The soldier thought to himself, as he wandered the land, making his way back home. Meanwhile, when he left Yoyo's floating citadel to do his Space Pirate duties, Ridley decided to rub some salt into the wounds of The Galactic Federation. Despite his near death experience, Ridley was overjoyed at the thought that he “killed off” Samus Aran in cold blood, right in front of her Chozo family. He may have almost died at the hands of Prince Amirani of Niflheim, Ridley still didn't give up on his conquest of despair and chaos. “So you really did kill off that little Samus brat this time? Correct?” Mother Brain asked, as the spherical orb hovered and darted around Ridley, as if it were a dragonfly. An hour or so has passed since Yoyo and her minions recruited the former half Esper girl, Terra “Tina” Branford. Yoyo decided to play her cards right with discussing matters with her new recruit. Terra was taken to Yoyo's personal chamber, where the two women were having a personal discussion with one another. Yoyo sits on her bed, complete with royal purple blankets and pillows, while Terra pulled up a chair in the Empress' room, sitting so where the two can make eye contact as they speak. The “Super Smash Bros” and “The Legend of Zelda” series is a trademark of Nintendo co. ltd. I do not own the rights to either series, nor do I plan to make a profit off of them. This story is written just for fun and entertainment, nothing more. However, I do own the rights to my original universe “Realms of Alerfa” and all of its characters. Maybe if you would ask nicely, you can write fanfics off my works. If you don't ask at all, then prepare to feel my wrath! Default Form 01: Lavender and White outfit with Veiled Turban. Default Form 02: Heroine in Green outfit. Default Form 03: Wind Waker inspired outfit. Default Form 04: Linkle's Green Hyrule Warriors outfit. Default Form 05: Heroine in Pink outfit. Default Form 06: Heroine in Blue outfit. Default Form 07: Heroine in Yellow outfit. Monster Guy Form 01: Goron Aryll. Monster Guy Form 02: Zora Aryll. “Mmmgh....Unnngh....What happened?” I thought to myself, as I awoken in a dark place. “Link....At last!” A young male voice exclaimed in excitement. “Welcome Link.” A young female voice added to the conversation. Right before my eyes, two beams of light shot right in front of me. Out from the beams, two divine figures materialized right before my eyes: A male figure, and a female figure. Both figures had golden blonde hair, azure blue eyes and fair skin. The male figure was dressed in a tan leather tunic, a white undershirt, a red and black striped scarf, black and white leggings, pale blue shoulder pads and fingerless gloves, white boots , and he also wore a multicolored arm guard over his right hand. His weapon of choice is a huge glowing halberd. Main Elements: Darkness, Ice, and Metal. Strengths: Can use elemental ammo, Can fly, Has superhuman speed, has a huge arsenal of weapons, Has a high tolerance to colder weather. Weaknesses: Weak against intense heat, Weak against the Fire element, Weak against the Wood element, Weak against Holy Water. Default Outfit 01: Blue Valkyrie Armor. Default Outfit 02: Holy Valkyrie Armor. Default Outfit 03: Dark Valkyrie Armor. Default Outfit 04: Gunner Bikini. Default Outfit 05: Gunner Catsuit. Cos-Play Outfit 01: Sailor V from “Codename: Sailor V”. Cos-Play Outfit 02: Elysium from “Soul Calibur V”. "So, _____, how many titans did YOU kill?" Shrugging, you replied to the blonde Erd, "I'm not sure. I wasn't really counting. There were too many of them bastards to kill to have time for that!" "Huh. Explains why Commander Erwin was so interested in you, then," Auruo responded. "Can you at least hazard a guess?" Petra shot daggers at Auruo with her heated glare. Their relationship was very argumentative and contrary towards one another, but it was obvious they were close. "Do you know how traumatizing it is to have her relive that horror?" You rode along on your horse contemplatively. The sun was now high in the sky, and the elite team of Survey Corps members rode idly through a thick forest, keeping out of sight and as far away from the main paths as possible. This made the journey to the abandoned Scouting Legion HQ the corporal informed you of a much straighter path, but any time saved in the process was lost to the slower movement through the underbrush.